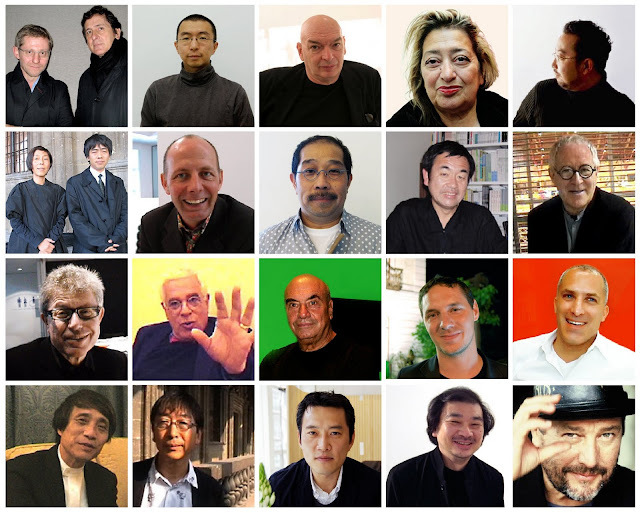 Designboom publishes monthly interviews with prominent figures from the design field, a total of 20 architects have participated to date. The interviews are conducted in the same format where interviewees across the board are presented with the same set of questions. Such a format yields a head to head comparison between these architects and designers, it gives the readers the opportunity to measure them against their peers. Here is the list of questions they had to answer. where do you work on your projects usually? could you describe your style as a good friend of yours might? is there any designer and/or architect from the past you appreciate a lot? what current architects do you appreciate? what are you afraid of regarding the future ? I have gone through all the interviews on architects and selected my favorite responses for each question. Amongst the selections, some are in my opinion the most playful or intriguing and some are simply answers I can relate to. To enforce an unbiased selection, I was blinded to the identity of these interviewees. In the end I’ve tallied up the amount of chosen responses from each architect. To my surprise, I had chosen at least one answer from everyone, and Minsuk Cho (Mass Studies) graced the top spot with seven impressive responses. I can see the results of this collation playing a role in choosing potential employers. Instead of solely judging the architects on their works, their character and personality also greatly influence the experience of a work term. I mean this doesn’t mean I will bolt for Korea for my next job, but it did open new doors. Click more to see the chosen responses. way about going to bed. that kind of music. so now I don't just listen, I study it. no, well I hear the radio but I don't listen to it . the sound just disappears around my head. of the world in a sensitive and high quality manner. at the same time reflect about the world. about the roman story, the roman empire: italians. my blackberry, in the morning, on my way to work. I have a web news service. most important information comes from my friends. I can feel the delicate truth. I assume you notice how women dress. partiality to prada and to miuccia (prada). to find people like that: dressing to show their individuality. I think the best is when a woman wears a dress. I like the dress that is like a double skin. I dont like to wear a tie, because a tie constricts my body. this is why the average life of ladies is ten years longer. no, only a cactus. it's maintenance free. no we don't, we have daughters (laughs). a dog named 'le corbusier'. their institution... to understand how they operate. but it always bounces back and forth with my team. mainly in the office because my work is not only done by me. but when I want to focus on something I prefer to be alone. in that case I work at home or in a starbucks cafe. do the same architecture on every spot on the earth. all the good reason to create something unique. the meaning of the world. we stretch utilities in the building. I call it 'primitive future'. people can use space creatively. I prefer something like the cave-like-unintentional space. korean, although that is how I got to know him. him and also do great buildings. also borromini maybe? recently and came to appreciate his work even more. and the designers from finland and the north of europe. between the human body and tools. (rem) koolhaas. rem was my mentor. continues things that I learned or started while with OMA. I'm either reinforcing or negating this experience. it is still a dialogue, whether it's directly with him or not (laughs). which are very different from each other. a hypothesis and then it must be carried into action. the focus was on drawing, abstraction and fragmentation. then it moved to the development of ideas. which is more fluid organization. “wow, that is very hard. who is your favourite baby? you know, usually we are never satisfied in what we do. different space, which hasn't been contaminated. I realized that in architecture this is never possible. it's always the next one.! introduce in my work, so I always experiment with my own memory. n: I would never have imagined myself being architect. n: she wanted to be a grandmother! kind of funny! n: to sit on the terrace and enjoy the sunlight. and a parent. I have a rule with my daughter. doesn't mean we're doing good. and we are separated from the construction. know what it is that you are trying to find out. not to be put off, intimidated by those who just happen to be older. I would say go into business, go into law, medicine, but don't be an architect. I'd recommend to do what you want to do. in movies and 'use' them in my work. and don't depend on the computer. first of all, to feel comfortable with life. then to open your eyes and open your ears that is essential. observe and reflect about what you are seeing. what architecture will be for the next 50 years. how to design. no one can teach you how to be creative. school are tools. focus on tools, not on your studio course.